Retail and FMCG organisations often struggle to decide what items or products are the best ones to discount or offer promotions for – what will get more customers in the door? What will help us sell more of these full-price products? What will ultimately maximise revenue? The answers to these questions lie in your data – unfortunately, many businesses don’t have the internal analytics capabilities to find them. Discounts and promotions have multiple objectives, all of which serve to increase revenue – do you want to attract new customers? Maintain existing customers but encourage them to spend more in store? Both, hopefully. 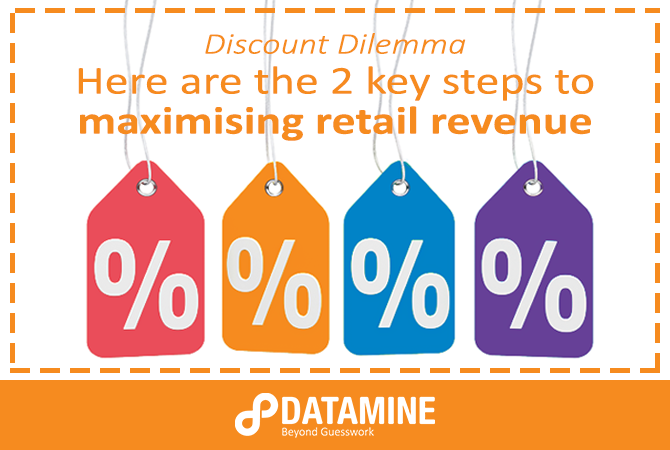 At Datamine, we offer our clients a solution known as Revenue Management – as the title suggests, the ultimate goals is to help retail and FMCG businesses maximise their profit, particularly with regards to pricing and discounts. Once you understand the dynamic between product prices and discounts, it’s much easier to tailor future promotions to these specifications in order to get the most out of them. Our team is well-equipped to help organisations dive into their data to analyse customer spending behaviour in relation to product pricing. Fill out the form below to get in touch with one of our team members, or check out some of the additional information we have on this solution. Interested in learning more about how Datamine could help you with revenue management? Fill out the form below to schedule a call with us.